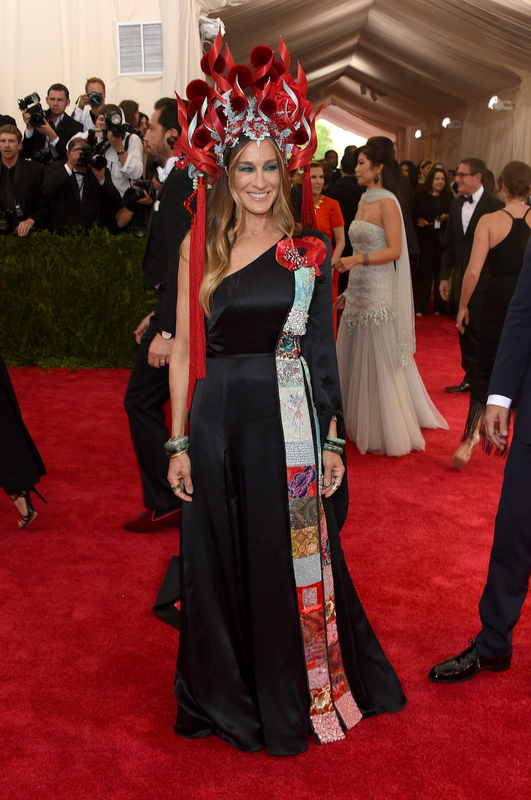 One could argue that the most highly anticipated celebrity to grace the Met Gala 2015 red carpet is Sarah Jessica Parker. Why? Because no matter what or who she's wearing, SJP always kills it, pushing the boundaries of high-fashion in the most eye-catching and extravagant of ensembles. And this year was no exception — Parker, in a black one-shoulder gown and a bold Philip Treacy headpiece, most definitely dressed to the theme, "China: Through The Looking Glass." We knew Parker would live up to the hype. Her one-shoulder gown, which she designed in collaboration with H&M, is seemingly simple with colorful accents, such as her poppy-covered cape and colorful silk embroidery along the side of her gown. She paired the dress with black, lacy shoes from her namesake collection and traditional jade bracelets. Although the entire ensemble is no doubt beautiful, it's definitely not what everyone is talking about. Parker's headpiece, which she teased earlier on Instagram, is what everyone has their eyes on. The red, flame-adorned accessory is reminiscent of an ancient Chinese headdress. It's lavish, to say the least, but I kind of love it! I don't think anyone else could pull it off except for Parker. Last year, Sarah Jessica Parker's awe-inspiring Oscar De La Renta ensemble made headlines everywhere. It looked like something Grace Kelly would've worn, but even more than that, something that SJP was born to wear. The back of the gown was probably everyone's favorite part, featuring a detailed back with Oscar De La Renta's signature in red. With another year in the books, SJP continues to secure her spot as one of the most fabulous Met Gala attendees, always giving us something to talk about and remember. But no one's exactly surprised. After all, Carrie Bradshaw would never let us down.